In the three years since the Nobel Committee awarded its prize in physics for the discovery of graphene – a new material that many think can change the world due to its unprecedented strength, flexibility and conductivity – researchers have been trying to establish the presence of magnetism, which could revolutionize its application in a number of areas. Now a team of researchers from Florida International University, the University of California–Berkeley, the University of California-Riverside and the Georgia Institute of Technology has unlocked a secret, establishing the presence of magnetic properties in graphene nanostructures at room temperature. “Our discovery could make graphene the most important contender in the race to become the core material in future computing chips,” said Sakhrat Khizroev, professor in FIU’s Department of Electrical and Computer Engineering. The team, which also includes Jeongmin Hong at UC Berkeley, Robert Haddon at UC Riverside and Walt de Heer at the Georgia Tech, has been working on these experiments since 2008. The pristine graphene used in the experiments was grown at Georgia Tech and chemically functionalized at UC Riverside. The physics of magnetism was studied at FIU and UC Berkeley. The potential applications for magnetic graphene would stretch broadly from information processing to medicine. A major focus for Khizroev and his fellow researchers is its application to the emerging field of spintronics, which stands for “spin transport electronics.” Also known as magneto electronics, spintronics involves a signal being processed using magnetic spin properties instead of an electric charge. Its application could result in higher data transfer speed, greater processing power and increased memory density and storage capacity. 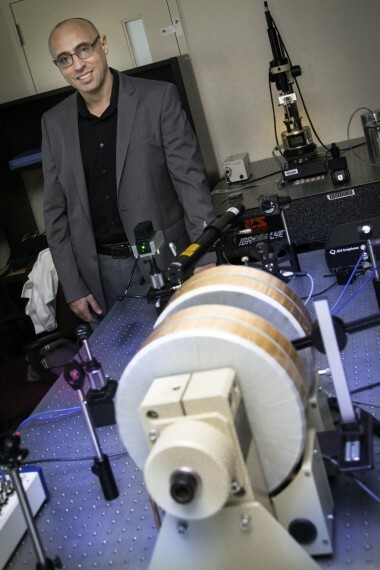 Khizroev and his fellow researchers believe their discoveries could lead to spintronic devices for energy-efficient and extremely fast information processing. A two-dimensional matrix of carbon atoms just one atom thick, graphene is of particular interest to industries where miniaturization is important, such as electronics. While silicon transistors have already gone about as small as they can go, graphene can be literally be as small as physically possible, opening up new frontiers for everything from computer chips to solar cells. The team’s findings are detailed in a paper published on the American Chemical Society’s publication, ACS Nano (http://pubs.acs.org/doi/abs/10.1021/nn403939r).